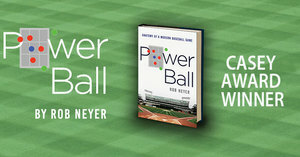 West Coast League Commissioner Rob Neyer's latest book, Power Ball: The Anatomy of a Modern Baseball Game, was the Casey Award winner for the best Baseball Book of the Year. The Casey Award was inaugurated in 1983 by Mike Shannon and W.J. Harrison, the editors and co-founders of Spitball: The Literary Baseball Magazine, and was the first award to honor the authors and publishers of the best baseball book of the year. Some of the greatest names in baseball literature (Roger Kahn, Bill James, John Holway, Harold Seymour, to name but a few) have won this coveted prize, but each of the 240+ books that have been nominated as finalists for the Casey Award are substantial contributors to baseball literature and would make a fabulous start to an impressive baseball library. The award is presented to the winning author at the annual Casey Banquet, held in the Cincinnati area. The evening’s hero and attending baseball bibliophiles are treated to an evening of baseball trivia culled from that year’s nominated titles, a traditional ballpark dinner of hot dogs, peanuts, and beer, a visit from the infamous Ballzak the Magnificent, and a display of all the year’s baseball titles! The West Coast League (WCL) is the premier summer collegiate baseball league west of the Mississippi. The 14-year-old, 12-team, professionally operated wood-bat league located in the beautiful Pacific Northwest showcases pro prospects from major conferences across the nation June through August. Out west, the league features an unparalleled history of memorable fan and player experiences and the best summer weather in North America. 72 players with WCL experience were selected in the MLB 2018 June draft. 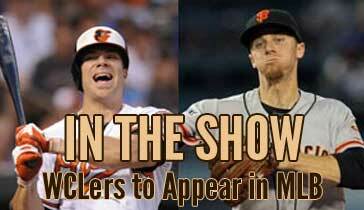 294 WCL alums appeared or were active in affiliated professional baseball in 2018 including 39 in the major leagues, such as 2015 home-run leader Chris Davis (Baltimore); slugger Rhys Hoskins (Philadelphia); rising star pitchers James Paxton (New York) and Matt Boyd (Detroit); and all-star outfielder Mitch Haniger (Seattle) and closer Bud Norris (St. Louis).